It's a cold and snowy Sunday. I'm wrapped up warm but feeling a little bored so put together this quick post. 1. 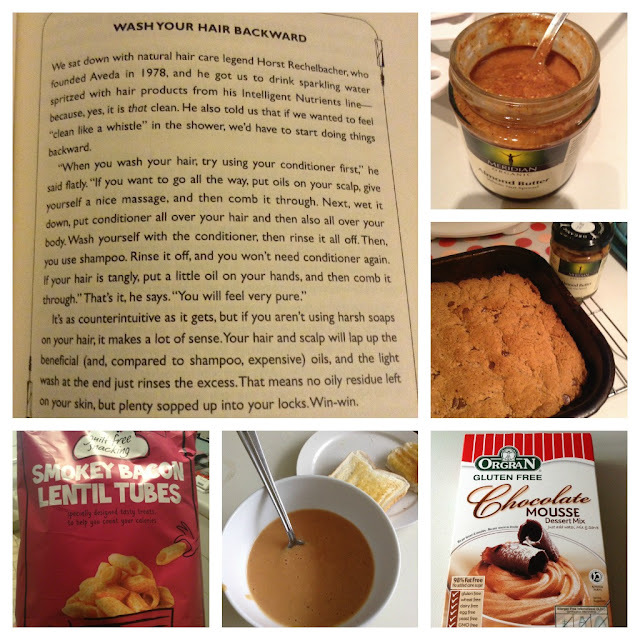 Wash Your Hair Backwards is from the No More Dirty Look book. I've washed my hair three times in this way and it amazes me how soft my hair feels. This method is designed for "clean" haircare not sure how it will work is your conditioner is full of SLS, parabens and silicones. 2. I used the Almond Butter in a Blondie recipe in replacement of Peanut Butter. These tasted good but were a little dry compare to when I use PB. 3. I discovered Smokey Bacon Lentil Tubes in M&S. They are free from milk and suitable for Vegetarians. The allergen advice lists that they contain Barley. These taste nice and I will buy again. 4. Baked Bean Soup was something I wanted to try after seeing on Australian Masterchef. I think it tastes great and I made it dairy free by using Oatly "cream" and soya milk. 5. Orgran Chocolate Mousse was a huge disappointment. Great texture but cheap chocolate taste. Not something I would buy again.